First of all, I actually love all five NMFT10 bands and each act has the ability to steal the show with best performance of the night. In this post I'll argue why The Taupe may end up impressing you most. (Hopefully I have time to lobby the merits of the remaining four bands in separate posts). The Taupe is probably the loudest, most powerful band I've invited to Canada. I mean any band can just crank up the gain and volume on their pedals and amplifiers, there's no skill or creativity in that. What The Taupe excels at is building a serene, beautiful soundscape then when you least expect it throttling you with an immense wall of noise. And the moment you're thinking "Holy s*%t these guys are INTENSE!" they double down and raise the ferocity level to the max. They don't play loud the entire time nor is it a slow tedious build to a crescendo, they deploy an unpredictable, masterful control of dynamics that will leave you speechless. Here's an analogy. Imagine you're in car with band members driving. Bands like Metz (from Canada, eh) and Boris are renowned for being LOUD. They primarily play loud and intense through their entire sets with predictable areas of rest before cranking up the noise again. There's not too much variance. It would be like racing through a straightaway stretch of highway at top speed, the driver slows down at the usual speed traps and then picks up the pace again when it looks like there are no cops. Other bands like MONO take a beautiful piece and build to a predictable crescendo, tone it down and then build to another epic crescendo. This would be akin to driving a car peacefully up a hill with a small gradient enjoying the autumn trees and mountains in the scenery and then bracing for the apex when the car will be racing downhill for a minute. Then you do the same thing again on another majestic route with another slow build but a slightly steeper downhill trajectory. Then you have The Taupe zipping along slightly above the speed limit, changing lanes to pass cars and they see a cop car ahead and slow down briefly before saying "F*ck it! Let's just gun it!" The cop car gives chase so The Taupe floors it but the cops start to catch up so The Taupe swerve left onto ONCOMING traffic. Miraculously, you and The Taupe navigate through to the nearest offramp unscathed leaving a pile-up of havoc and devastation behind you. That was a bit crazy so The Taupe slows down, you calm your nerves and spot a beautiful hitchhiker whose car broke down. You tell The Taupe not to pick her up but The Taupe like to live dangerously and help those in need so they let her sit in the passenger seat. There's a stretch of mountainside highway with a view of the Pacific ocean. Lots of twists and turns and you speed through them with finesse. But "Oh S*%t!! It's the cops again! The Taupe puts the pedal to the metal, again the suped-up cop car starts to close the gap but not only that, there's a freaking ROADBLOCK ahead with an entire squad of cop cars. This time The Taupe swerves right, gives the cops the finger and you find yourself violently off-roading down a treacherous forest slope with occasional boulders in the way. But not only that, you notice the driver has his f*cking eyes closed because the hitchhiker has proceeded to give the driver head. What the HELL?!! But it gets worse, the forest hill is about to reach an abrupt end, the brakes are destroyed and you crash through a barricade with the car hurtling in the air dropping twenty feet into a river. Your entire life flashes in front of you. Somehow you all survive and not only that but one member of The Taupe caught all the footage on his Samsung S8 and he's already sending you the video via LINE. There's a huge variety in mood in The Taupe's songs ranging from dark and creepy, uplifting, serene, poppy, danceable, raging, to exalting and the sonic intensity can switch from a soft whisper to eardrum shattering in a heartbeat. The Taupe's music is an unpredictable adventure with an intelligent, sophisticated and incredibly intense delivery. Most of their songs aren't even loud but they can catch you off-guard at any moment with a sledgehammer to the face. Unfortunately, The Taupe's studio recordings do a poor job of capturing the sheer intensity of their live performances. I wasn't too impressed. Sounds too much like college radio indie. But in hindsight, it really shows their versatility as this song has a nice Velvet Underground meets post-punk sound that's starkly different from all their other material. "Holy Fu^k. Not that I ever doubted you, but the Taupe are unreal. Like, they're the type of band that makes me wanna play music but simultaneously making me think I could never achieve that level of badassery"
Steve!! I saw the Taupe tonight. They're SICK!! So hyped for May. Ya omg their show is HYPE and the girl is so pretty!! To me how attractive the band members are is waaaaaaaaaay less important than the quality of their music. But if they happen to have an attractive female member then bone... BONUS. So Sania thinks Onodera (bassist for The Taupe) is very pretty. 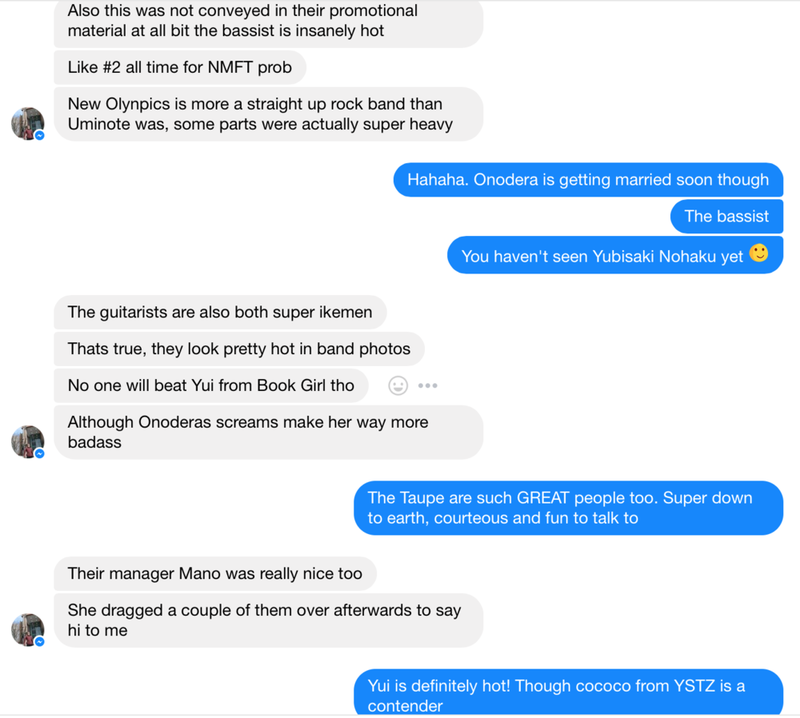 Eric mentions the guitarists being super-handsome and that Onodera is insanely hot... the 2nd most attractive female out of all the NMFT tours with Yui from Maison book girl reigning at #1. I countered that he'd have to meet the members of Yubisaki Nohaku before making that claim and cococo (and Komachi) of Yukueshirezutsurezure are also beautiful. But yeah, with Onodera's ravishing looks, her mad skills on bass and her ability to SCREAM HER LUNGS OUT, she is definitely someone who'll haunt your dreams. The video above doesn't come close to her full level of screaming prowess. For that, you should listen to the song "ダーカーソーシャリティ" (Darker Sociality) contained on the NMFT10 sampler I've been secretly distributing on the NMFT Facebook page (*shhhh*). Onodera makes even Shidare from YSTZ step backwards in fear. The Taupe are a truly magnificent band with lots of variety in their music and the capacity for MONSTROUS, face-melting sound. Not only will they challenge for best act at NMFT10 but they're one of the best bands I've invited to Canada.. period. But stay tuned for why any of the other four bands may pull the rug from under The Taupe and steal the spotlight! !